Pressure cook ½ cup red beans / olan beans / cow peas with enough water. After the first whistle, simmer and cook the beans for another 2-3 minutes in low flame. Wait until all steam has escaped. Once the pressure settles, open the lid and keep it aside. Olan beans should not be over cooked, it should hold its shape. Grind coconut, cumin seeds and shallots with little water to a smooth coarse paste. In a pan, add pumpkin, little water and salt, cover and cook in low flame till pumpkin becomes soft and tender. Add cow peas, ground paste to the cooked pumpkin, mix well, slightly mash the pumpkin and cook for 3-4 minutes. For seasoning, take a small pan and fry the coconut till it turns golden brown. Keep it aside.In the same pan, heat oil and add mustard seeds. Let it splutter and then add green chilli slices, red chillies and curry leaves. Fry till the shallots turn golden brown. Turn off the flame and add the roasted coconut and the tempered ingredients to the curry. Mix well and add salt if needed. Cover with a tight lid and leave it aside, so that the flavors get locked in the curry. Garnish with roasted coconut and serve with hot rice. OLAN BEANS : ½ cup uncooked beans yields 1 cup cooked beans. VARIATIONS : It is made with a combination of vegetables and beans. So erissery can also be made with vegetables like kaya (raw banana) and chena (elephant yam) using the same recipe. Olan beans is pink cowpeas (van payar). You can also use black-eyed peas instead of pink cowpeas (red beans). Another variation of this recipe is Yellow Pumpkin Erisserry. 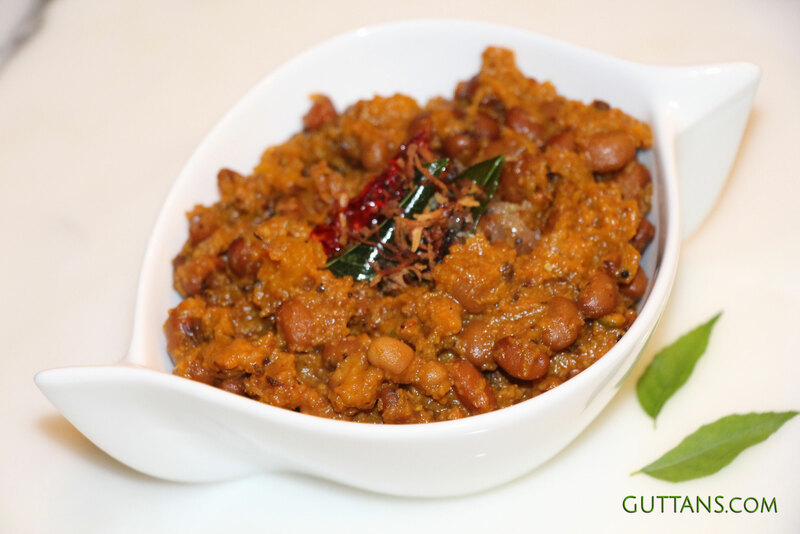 Pumpkin Erissery Recipe – Mathanga (Pumpkin) Erissery – Pumpkin Red Beans Curry – is one of the traditional recipe of Kerala (South India). It is a typical essential dish that is served at almost every traditional festival sadya (feast) in Kerala.